Have a power adapter and a power board – will travel. We started early, taxi to the airport at 6AM. We checked in our luggage and headed through security before looking for what was the 2nd breakfast of the day. Found a strange little place that sold toast with slabs of butter as thick as the bread, and eggs. I had something that was advertised as coffee, but wasn’t, and included far too much sugar. We set off for the gate, but it only opens 1 hour before the flight departs. I managed to get onto some internets and downloaded a recent podcast for the flight. I also managed to remote home and download Wednesday Night ABC TV Night from iView. #GiantNerd. The Air India flight wasn’t full, and had significantly more leg room than our last Qantas flight. Enjoyed an omelette for 3rd breakfast. Flying into New Delhi we could see the size of the city, and the amount of the smog. Going through customs wasn’t too much of an effort, but the officer did ask about my hair, where it was, and said it was a very strange hair cut on my passport. I removed my bandana and he laughed. The same officer processed my Dad and Mum, when he looked at my Mum’s landing card and asked “Why would you go to Lucknow?”. This is a good question. 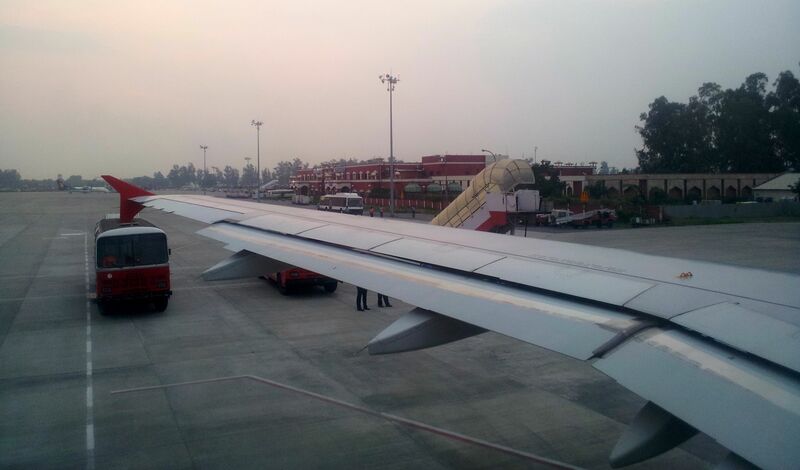 We were the only westerners on the flight, or in the airport that I could see, and this was New Delhi. The new New Delhi airport is clean, pristine, and mostly empty. There was hardly anyone there at all. Not wanting to get ill in the first hour we went to Maccas for 4th breakfast / lunch, where the options included chicken, or veggie, or chicken. Heading down to our domestic flight Dad and I are the mistake of not having luggage tags on our hand luggage. Out of the line, find some luggage tags, back in line. After going through the metal detector they asked me to go back through and take out all of my hard drives, tablets and cables out of my small bags. An iPod, a phone, Nexus 7, and one micro USB cable. They didn’t ask me to take out any of the 4 HDD, camera, or multiple power adapters in my large backpack. Got felt-up by the nice man with and hand held metal detector. Explained the thing beeping was a zip on my pants a few times. The domestic flight was around an hour late leaving. There seemed to be a large number of fly in fly out workers coming in from a connecting flying that was delayed. I’ve never seen that many brief cases in a single place before. Most of the locals had a brief case, basically no rolling hand luggage. We were the only westerners on this flight too. A little less surprising. Landing in Lucknow the international airport made Canberra Airport look big. The new airport building was on the other side :-) but it was tiny. Lucknow actually has direct flights to the middle east, which I think is for the fly-in-fly-out workers who would spend a number of weeks working over seas at a time. 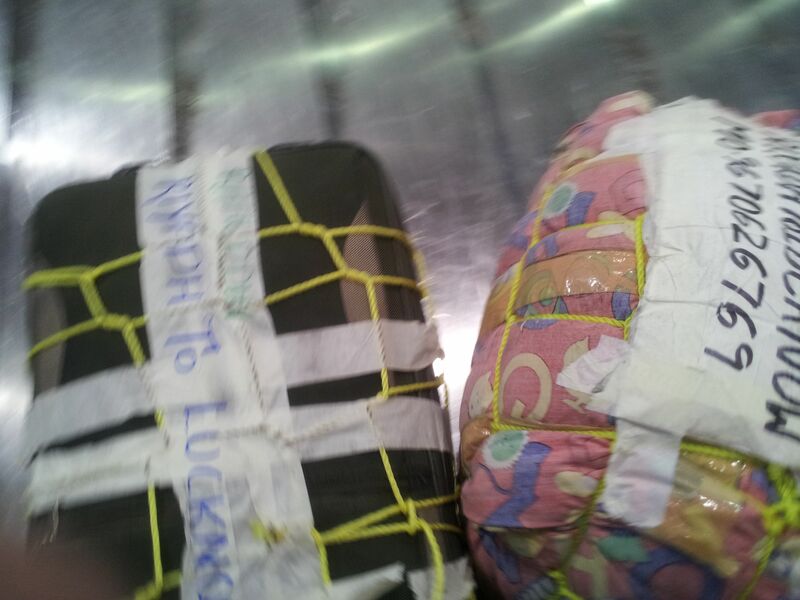 We waited by the baggage carousel, and noticed that all the luggage was bundles of things bound with thin rope. There were a couple of suit cases bound with rope. Located a pre-paid taxi stand, paid for our taxi and went out side. Everyone started yelling at us, asking for a wagon number. We ignored them, because we had a pre-paid taxi, and were looking for our pre-paid taxi. After a couple of minutes someone tried to be polite and explained they they were all the pre-paid taxi drivers, and just wanted to know who was going to take us. We found our guy head out to his car, and ignored the small children running after asking if they could take our bags. The drive into town and the hotel was less than 15 kilometres, this trip took over an hour, and our introduction to India was complete. Bedlam just doesn’t cut it.